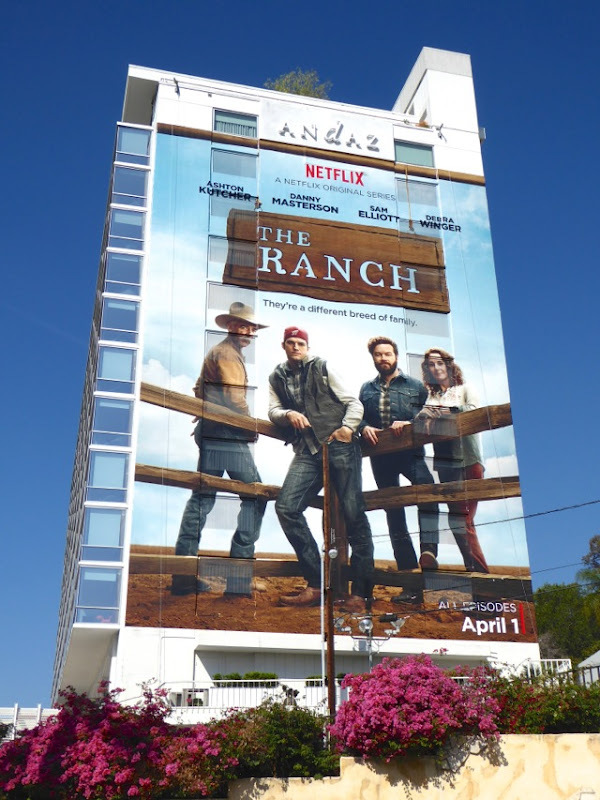 Netflix are supporting their new sitcom, The Ranch, in big way this month, with giant-sized ad creatives and special cut-out extensions to help attract your attention and secure an audience. 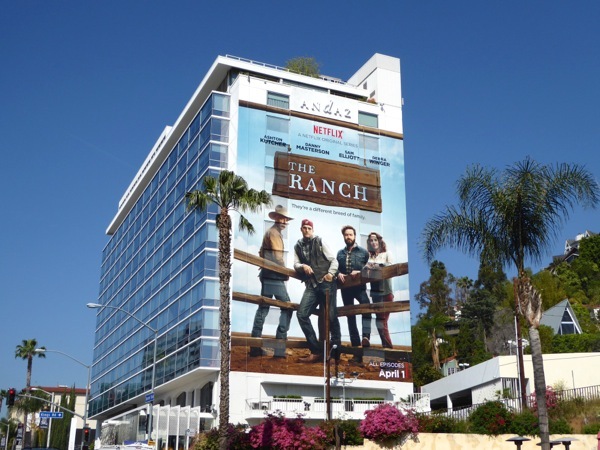 The multi-cam comedy also has an impressive cast to draw you in too, with familiar names like Ashton Kutcher, Danny Masterson, Sam Elliot and Debra Winger as the homestead family. 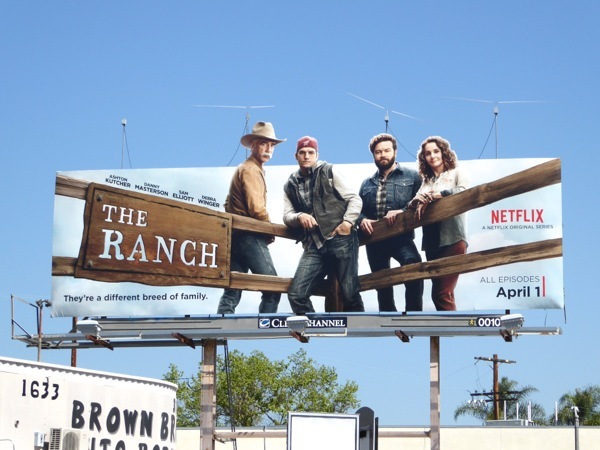 No stranger to sitcoms having recently starred in the last few seasons of Two and a Half Men, Ashton Kutcher reunites with his co-star from That '70s Show (Masterson) as he returns home to his family's Colorado livestock ranch to help run the business after a disappointing semi-prop Football career. 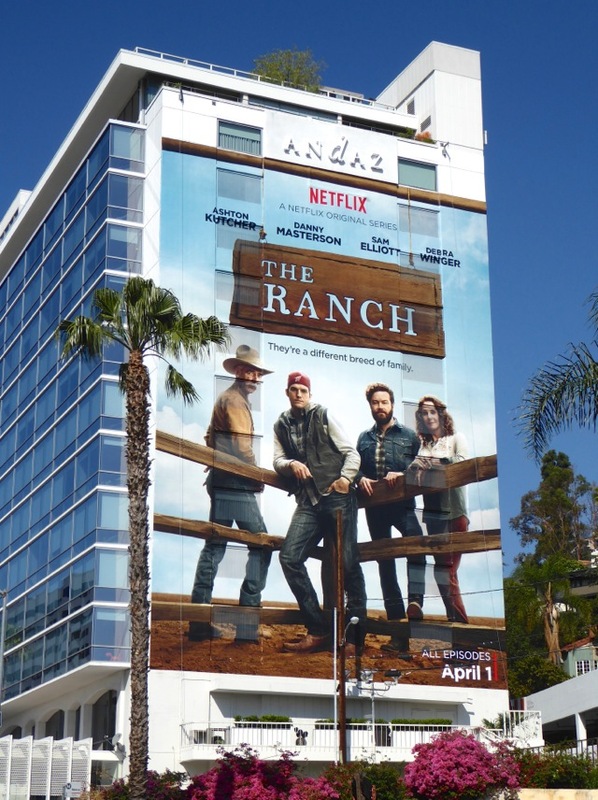 Are you ready for a new breed of family sitcom, with a former high school football jock, a grouchy rancher father, his bar-owning ex-wife, an overshadowed brother, and no doubt plenty of animal-rearing jokes? 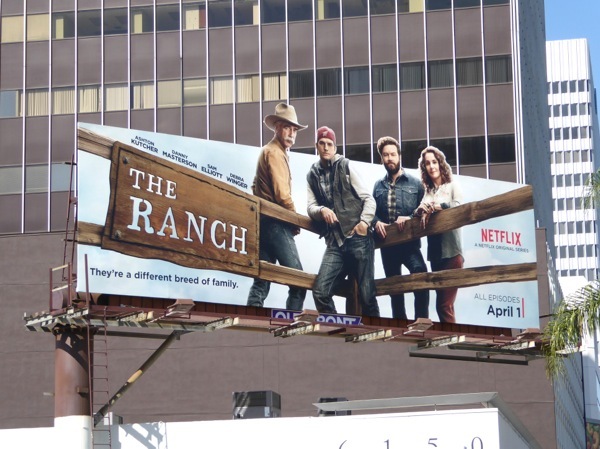 This ranch fence ad design really draws you in and the special extension cut-outs help the billboards catch your eye even more. 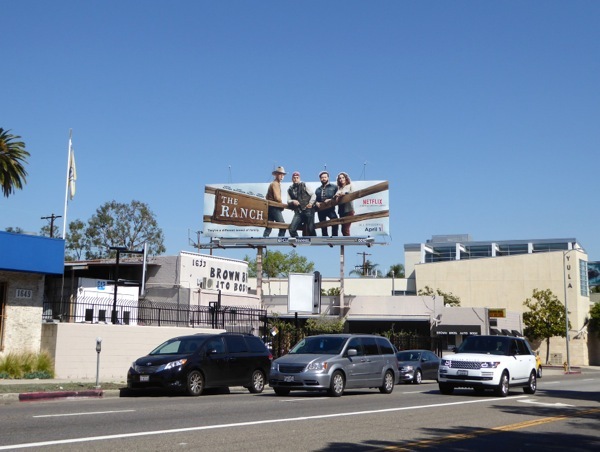 There's also something about these billboards for the countryside-based show which stand out even more juxtaposed against their city settings, with the busy roads and shining buildings. 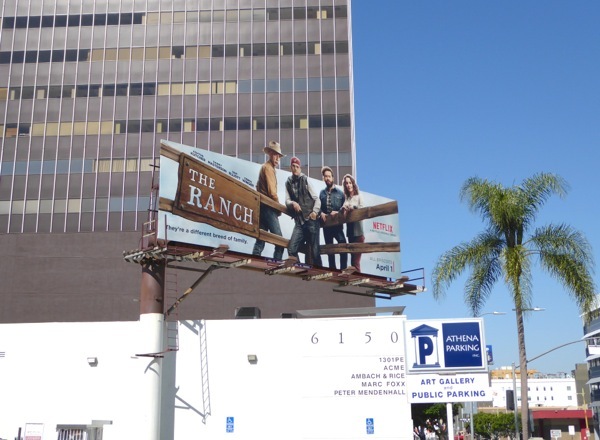 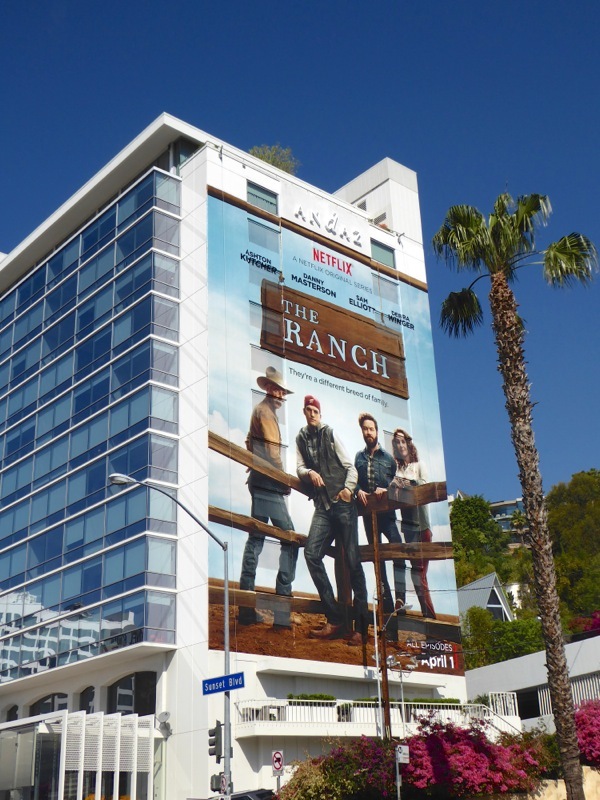 These special extension billboards for The Ranch were first snapped along Robertson Boulevard on March 31, then later along Wilshire Boulevard on April 2. 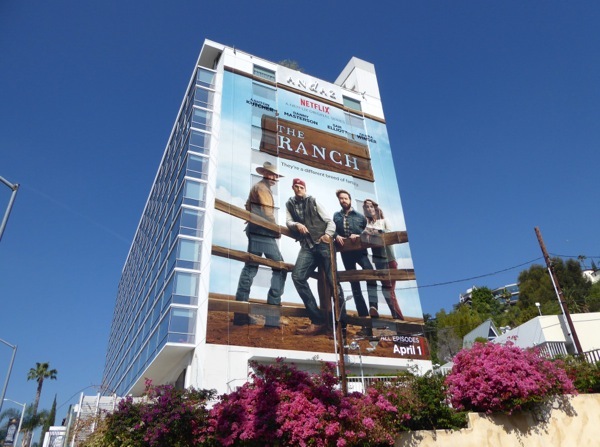 Meanwhile the giant-sized ad wallscape was photographed on the westbound side of West Hollywood's Andaz Hotel along the Sunset Strip on April 12, 2016. 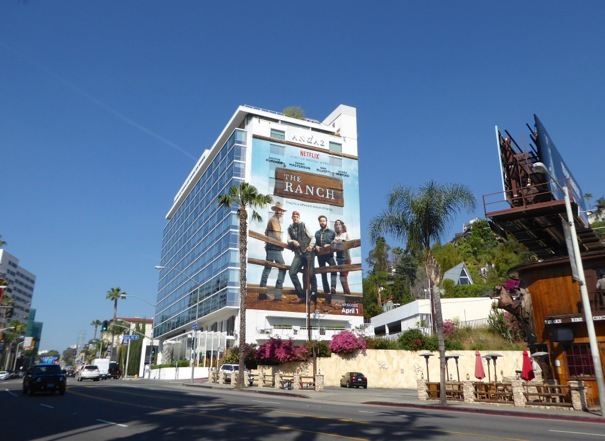 If you're a fan of Ashton Kutcher, make sure you also check out these Popchips billboards from 2012 and these No Strings Attached movie billboards with Natalie Portman from 2011. 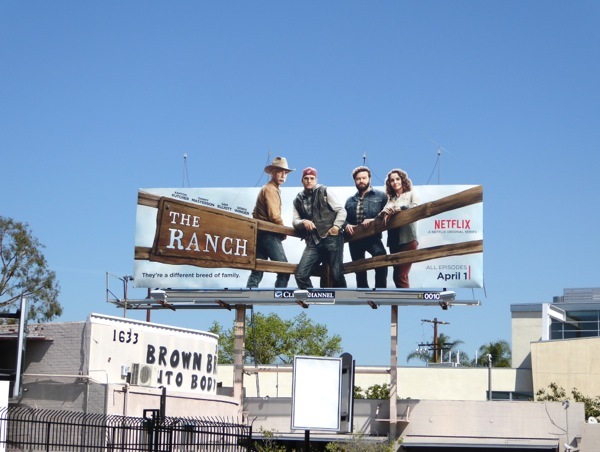 Only time will tell if the giant streaming service can rope itself an audience for the first ten episodes of this new comedy and if another season will follow hot on its heels.